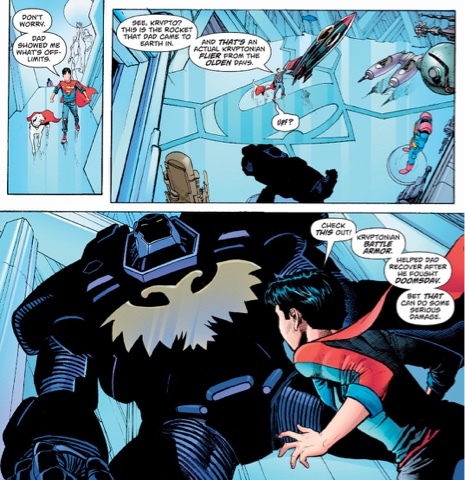 Blinded by Phantom Zone energy, Superman has retreated to his Fortress of Solitude for tests, and with a slew of his greatest enemies on the loose, he's taken Lois and Jon there for protection. It's a sensible plan - his Arctic retreat houses some of the best defensive measures on the planet, where better to regroup, recover and plan? 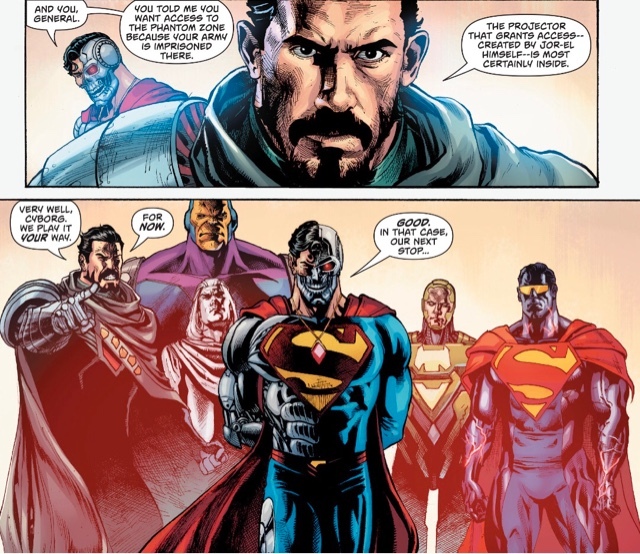 Sadly, it's that very treasure house nature that makes the stronghold so attractive to General Zod, Blanque, the Eradicator, Mongul, Metallo and their - he hopes - leader Cyborg Superman. Scenes of the Fortress of Solitude under siege bring back memories of the era-ending Whatever Happened to the Man of Tomorrow tale from the Eighties - 399 issues ago, hmm - but somehow I think this story will have less drastic consequences. Revenge Part Four is that rare thing, a middle chapter that manages to be exciting from start to finish. The tension between the bad guys - well, Zod and everybody else, basically - is lots of fun, while the matter-of-factness of Clark, Lois and Jon is good to see... there's no hysteria, more stoic resignation. Well, except with Jon, he's having fun playing tour guide for Krypto. It's a sweet character moment for the new Boy of Steel, one of several standout scenes this issue. These definitely include the sightless Superman's gutsy attack on half a dozen of his most fearsome foes. The worst of them is Zod, who wants to take his decades-long anger at rival Jor-El out on his son... and possibly grandson. Which isn't to say writer Dan Jurgens didn't make me laugh with this little Zod moment. 'Human mutts'? Heel before Zod! And yes, Zod does get his catchphrase in... the guy really needs some new material. The material on his current outfit, though, is terrific. 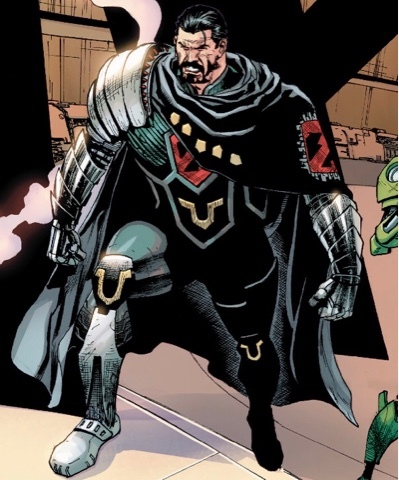 I love this costume, I think it's regular Action artist Patch Zircher's tweak on a Jim Lee design, with Zod like a Kryptonian Samurai who's seen too many spaghetti Westerns - dig that poncho! ... and then a close-up with a terrifyingly leering Zod to the fore. I think both images are the work of Herbert, inking himself. 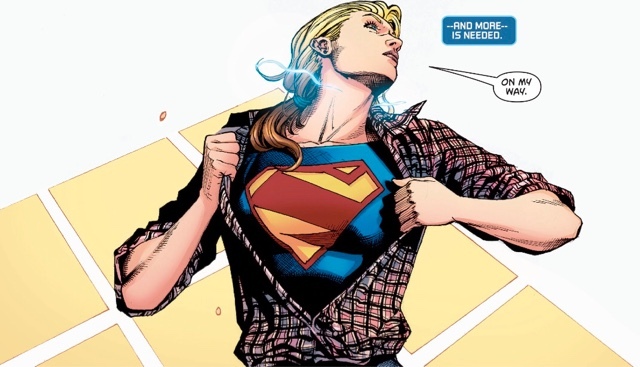 Luís, partnered with Ray McCarthy, is responsible for one of my other favourite panels, a changing-to-Supergirl shot that screams 'instant classic'. Supergirl? Yep, he may not get the League to show up, but Superman does call in some heavy hitters close to home, and the final page splash of them arriving is glorious. I think that's Luís and McCarthy again - I'm trying to find out for sure. All the artwork is beautifully coloured by Hi-Fi, while Rob Leigh is, as ever, the Lord of Letters. 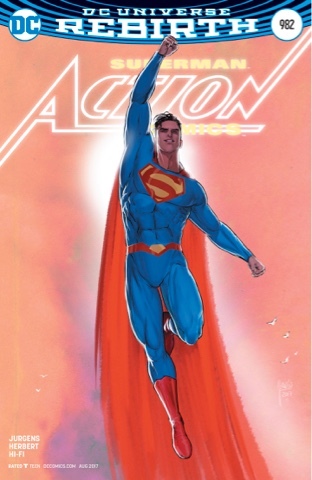 Hi-Fi also colours the cover by Zircher, who gives us a composition featuring Superman and all six baddies which manages to have dynamism and depth alike - it's elegant work. Gary Frank isn't around for the variant this time, but I'm never going to complain about a Mikel Janín illo... is it me, or is there a bit of current TV Superman Tyler Hoechlin in there? With a terrifically structured and executed script by Jurgens - did I mention there's a very mysterious moment during Jon's tour? - and drop-dead gorgeous art by Herbert, Luís and co, this is a thrilling diversion for fans of Clark, Lois, Jon and Krypto. 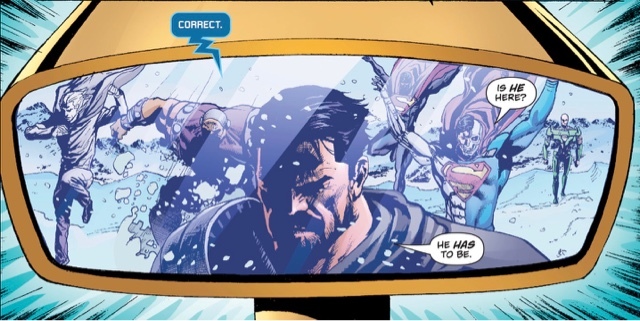 "The Fortress of Solitude under siege brings back memories of the era-ending Whatever Happened to the Man of Tomorrow tale from the Eighties"
- Cyborg Superman talking about Batman's anti-Superman plans... and Zod praising his strategy! Someone should tell Bruce "Have you EVER noticed your 'Just in case' plans are always found by our enemies? And a super-villain approves of them?" - Jon mentioning "Grandpa and grandma Kent". How great is that? - Superman's emergency plan is... to call Supergirl. I like the implication she's the one he trusts the most. - Superman spots Mongul... by his bad smell. Bwahahaha! - Zod finding another chance to spout his catchprase. - Supergirl is the first to arrive, and she is the one saves Superman. She dove in so fast they never saw her coming. - Am I imagining things or Herbert draws her older? She looks like a woman in her twenties rather than a teenager. - The Superman Family have come together! Well... the Superman Family and Lex Luhor. 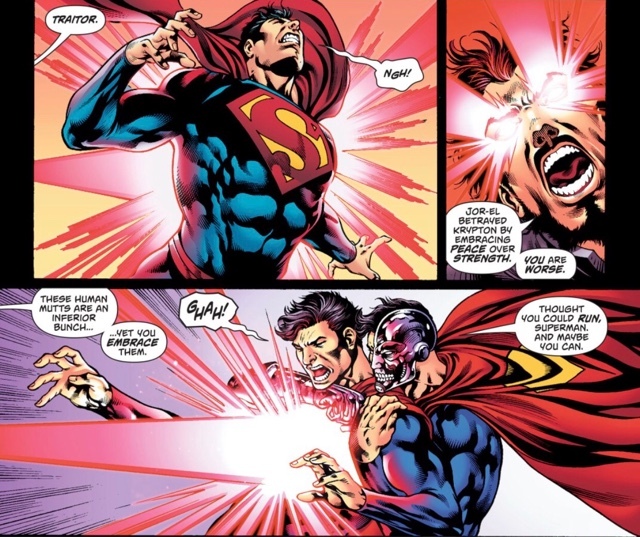 I wonder how Superman first met Zod in this continuity. It's "Last Son" partially canon? It was a bit weird seeing the talk of anti-Superman Bat-plans given how pally they are since Rebirth, but it seems to be a bit of Nineties business that has stuck, sadly. I laughed at your sharp scenario, yeah, those plans do tend to backfire. Kara is definitely older-looking here, and I love it... hopefully that's how her new artist (yeah, I'm fudging here, is it Robson Rocha?) will draw her. I think part of the problem with the "prep time" thing is that it's been taken way, way, waaaaay out of the context of the story it was originally introduced in. Mark Waid's entire JLA doesn't do anything to prop Batman up. Quite the opposite, other than Wally West declaring he couldn't POSSIBLY know better than Batman, the idea is that whatever the merits of having "safeguards", what he did was still unhealthy. As Superman said, the difference with handing him the Kryptonite ring was that Clark knew and trusted that it would be there. 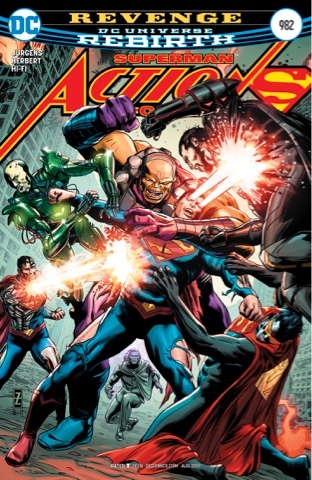 Whereas the horror of the story is how easily Ra's is able to turn Bruce's plans lethal and the ripple effect this has on the League, a group that HINGES on trust to save the world. It's as much a critique of the paranoid post-Miller Bats as anything else. Unfortunately, and very likely because of DKR, what the internet and DC seized on was the idea that Bruce could beat the JLA any time he wanted to so nyah nyah! Thanks for that reminder, Simon, it's so long since I read that Waid JLA story that I'd forgotten the nuances. I think I'm going to give it another look this weekend!